We gather each Sunday morning for worship at 9:00 & 10:45am, and also gather at many other times throughout each week for learning, fellowship and service. 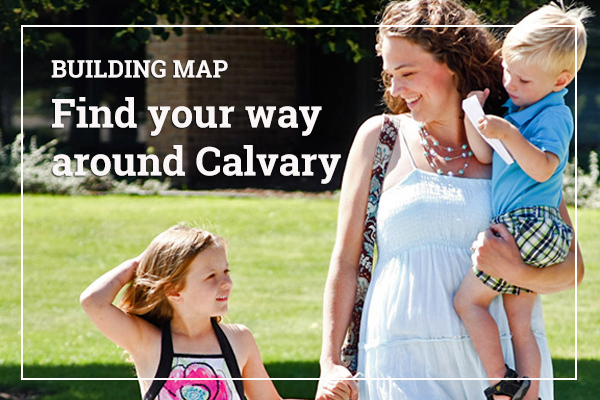 When people ask who Calvary Church is, we respond that we are and desire to be Christ's church in this place. The church is different than any other institution on earth. How? The church is the only institution that Christ Himself promised to build (Matthew 16:18). So the church is the mission of Christ, which means that He is doing something in us communally. Christ not only saves individual believers, but is forming a people for His own possession (1 Peter 2:9). The church is a concrete community that engages in practices such as assembling, maturing, serving, caring and witnessing. These five practices help us understand how the church's theological identity is experienced and expressed. They provide direction to both newcomers and members of Calvary as they seek to be involved in God's work here. We assemble as a church from diverse backgrounds and cultures to confess Jesus as Lord in worship, to hear God speak from His Word and to identify with Christ in communion and baptism. Our gathering together on the Lord's Day as a large body is central to everything we are and do as a church. The desired progression for believers is spiritual growth in the context of community. By receiving and living-out biblical wisdom, identifying with Christ, enduring through suffering, imitating godly examples and experiencing God's presence in corporate worship and smaller fellowships, God's people grow in Christ likeness. The Holy Spirit equips each believer to serve and to practice mutual interdependence. Each member makes a contribution to the church by the use of natural talents, material possessions and spiritual gifts. As a result, the church participates in the work of the Spirit and is unified and strengthened. Christians are adopted into God's family, the church, where they find a web of relationships characterized by commitment, affection and accountability. Members of God's family both rejoice and suffer together. While seeking to do good to everyone, believers especially seek to bless those who are part of the family of God. God has entrusted the message of the Gospel to His people. Through His church and individual believers proclaiming the Gospel, God appeals to the world to be reconciled to Christ and, as a result, Christ's church is multiplied throughout the world. In addition, the love of Christ expressed in Christian relationships witnesses to the wisdom of God who is uniting all things together in Christ.